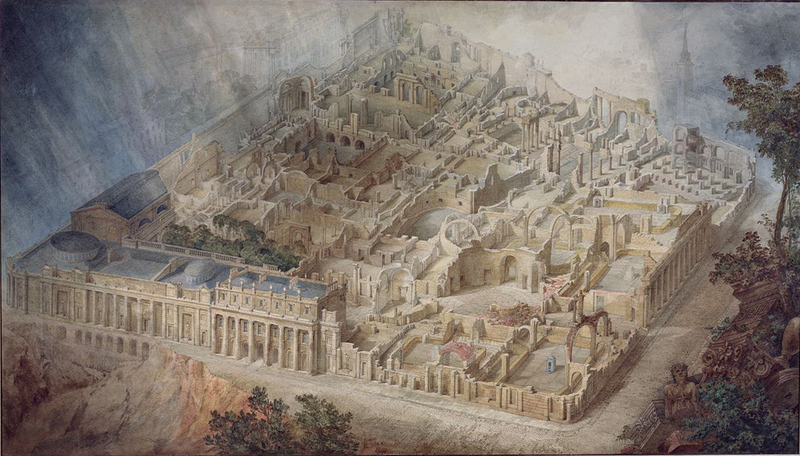 If you take a look at Joseph Michael Gandy’s painting A Bird’s Eye View of the Bank of England (1830) there is a small blue box towards the bottom right hand corner. Is it the TARDIS? Is this a late April Fool by the BBC and Tate Britain? Here’s a blow up of the corner. 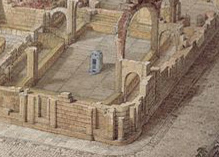 A Bird’s Eye View of the Bank of England TARDIS? Sadly if you see the real picture up close at Ruin Lust its not a TARDIS but its a nice bit of fun to play with the idea that it could have been included by the artist after an encounter with the Doctor in the 1820s. Maybe the Doctor prevented the destruction of the Bank of England. Anyone spot a DALEK? That's a good one Mark. I will choose not to look closer and will leave it at a Tardis, thanks!